Now we're actually in December I thought I would start posting some Christmas nail art. I have actually created this look previously but at the time I was struggling trying to find either sticker or decal (transfers you apply using water) bows to use so I drew a bow on with a nail art pen (the pen was pretty rubbish!) and it didn't work so well. Recently I finally found some decal and also 3D bows on Born Pretty Store so I ordered some and waited patiently (ok very impatiently) for them to be shipped over from America. For the base I wanted to use something that looked like sparkly Christmasy wrapping paper so I went for Illamasqua's Seance as this has an amazing shimmer running through it. After this had dried I then applied stripping tape across the middle of each nail, leaving the ring finger. I then applied a top coat to all nails including the ring finger. I didn't want to rely on the top coat to try and stick the bow to my ring finger so I used nail glue instead. 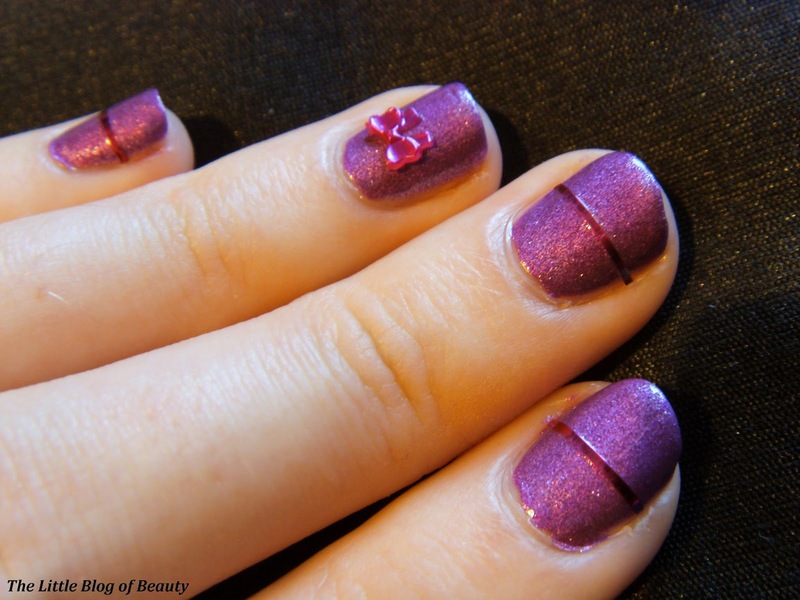 Once the top coat had dried I used a pair of tweezers to hold the bow while I applied some nail glue to the back and then used the tweezers to position the bow on my nail. As the nail glue doesn't dry too quickly you can make sure it's exactly where you want it before it dries in place. 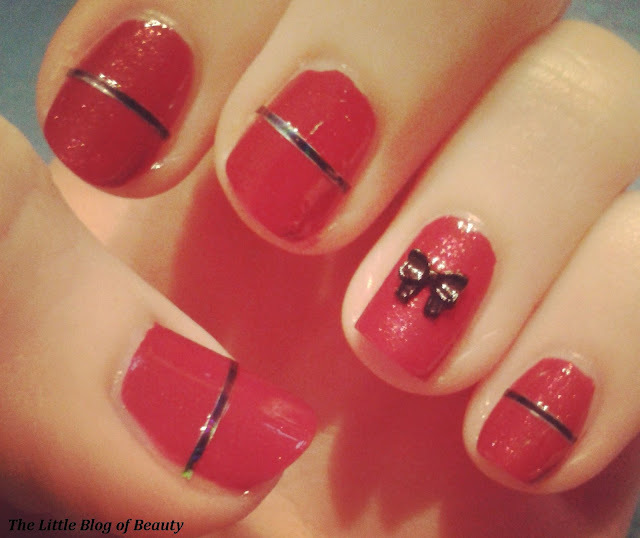 I was actually pleasantly surprised by how long the bows stayed on my nails. In my experience of using false nails, which admittedly is limited, they have always popped off pretty quickly. The bows stayed in place really well though despite me catching them on pretty much everything including my hair, clothes, shoes, my bag, my boyfriend.... In fact they were quite difficult to pull off when I decided it was time to remove my nail varnish. There's any number of different colour combinations you could use for this look and you could create it now over the festive period or at any point during the year for somebody's birthday. I also tried this again with more of a contrast between the nail varnish and stripping tape using red 'wrapping paper' and black 'ribbon'. I'm sorry the picture above is not very good quality, I had to take this from Instagram as I didn't have a chance to take a picture on my camera while this was still on my nails but I wanted to show you the more contrasting look. 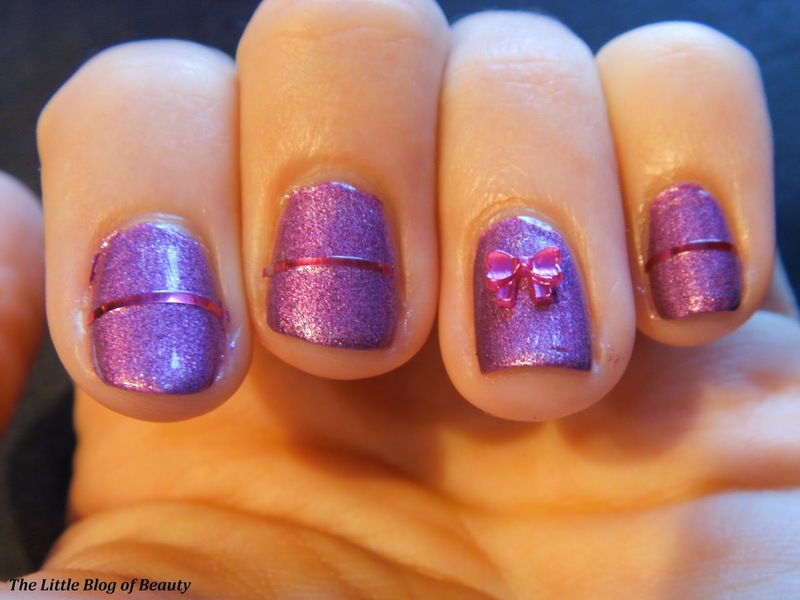 What do you think of gift wrapped nails with 3D bows? Both colour are gorgeous. I love the gift wrap effect you have done ! AWWWWH, they're way too cute! I'm really enjoying your blog and have just followed you babe!